Love this film! One of my favorite Woo pictures. Just visually stunning.You are correct about Woo staging action scenes. He's brilliant at it. Good write up! 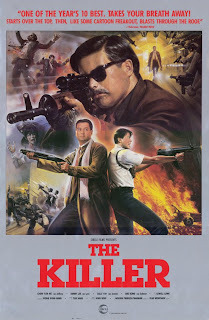 This film and Hard Boiled changed the way that I look at action movies. The choreography of the gun play is breathtaking. Chow Yuen-Fat's performance set the standard for the "Heroic Bloodshed". Only surpassing himself in Crouching Tiger Hidden Dragon. This film is balletic (yes I said it...sorry), brutal and at times beautiful. Yet another film that I should have seen, but have not. I was going to get the Criterion disk once upon a time but it went OP and the price went into the stratosphere.